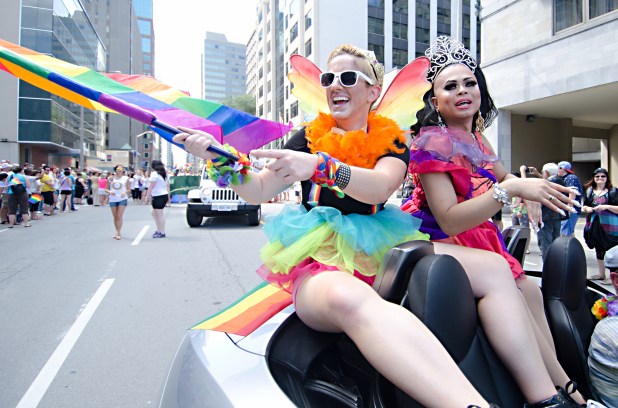 Capital Pride paraders cruise down Laurier Avenue during the parade Sunday, Aug. 24. .
Two groups are vying to take over the beleaguered Capital Pride festival, after the organization officially dissolves on Wednesday night. The group’s last annual general meeting is likely to be a heated one, as board members will face tough questions on the organization’s bankruptcy, alleged accounting irregularities and the future of the festival that’s due to celebrate its 30th anniversary next year. Current chair Jodie McNamara has already been facing criticisms online about creating a “secret committee” to take over Capital Pride. But she maintains that’s not the case – her group has simply not publicized it. According to a post on her Facebook wall, she has about 20 people in her group from about 14 different LGBTQ groups. Whatever happens, the Capital Pride membership of 100 people will be asked to help decide the festival’s fate at the AGM with a vote on which proposed successor the comunity should go with said McNamara. Although she conceded that the vote would not be binding and anyone could throw a pride festival, such a festival would be meaningless without buy in from the community. McNamara also reportedly told Daily Xtra that Capital Pride has a “significant offer” from a potential sponsor, which would help pay for the parade and a fair. Another group hoping to take over Capital Pride is being led by Francois Zarraga, who said he has “had enough” of the current organization. While he said the alleged financial irregularities are the key problems plaguing Capital Pride, he also takes issue with the group’s failure to include Gatineau. He would not give details on his plans, but said he envisions Pride on both sides of the river, complete with a full French translation. His group – which he said has just three members, but is growing – has been in the works for about a year. “We cannot have the same people in the committee ever again,” he said in a Facebook message. Capital Pride declared bankruptcy in October following allegations of financial irregularities and cheques bouncing. Event producer Sebastien Provost said a $23,700 cheque for alcohol bounced. Guillaume Tassé, who supplied portable washrooms, lighting and sound systems, among other items said he was still waiting for a $42,000 cheque at the time the group declared bankruptcy. The Capital Pride AGM will be on Wednesday at City Hall starting at 6 p.m. It’s open to the public. In a notice about the AGM, McNamara said the Capital Pride board of directors would not take questions from the floor about bankruptcy, for legal reasons. However, there will be a report and a lawyer available to answer general questions. The Children's Aid Society of Ottawa also takes the cake for some of the most vile Child Abusing Criminals in Ottawa like Marguerite Lewis a lawyer for the Children's Aid Society, a notorious supporter of "Gay Pride" events even though "Gay Pride" has absolute nothing to do with Child Protection. The Children's Aid Society is entitled to believe in diversity however they discriminate against heterosexual males, especially fathers. Across Ontario, the Criminal Cartel of Children's Aid Societies seeks out and employs those with a pathological hatred of fathers. Marguerite Isobel Lewis goes to extraordinary lengths in her war on fathers. father, even telling him that he deserved absolute cruelty. Marguerite Lewis gave personal evidence , a complete fabrication, that the father made admissions when no admissions were made. She then fabricated that the mother's admission to assaulting the children was not an assault but discipline, a classic lie told in numerous cases where Child Protection Workers Fabricate evidence for mothers. She did that in front of a Corrupt Judge Timothy Minnema who used to work for Ontario's Criminal Cartel of the Children's Aid Societies at Kingston before he became a Judge, a rubber stamp for the CAS, and even personally fabricates evidence against fathers not to mention turn a deliberate blind eye to CAS lawyers when they blatantly fabricate evidence in front of him. Ottawa has another pathological man hater, CAS lawyer Tracey Engelking, who obstructs justice by going to her special judges who give her "Ex Parte Orders" to place children with the most violent of mothers, without notice to the father. Its called Obstruction of Justice. Promotion of hatred is also a criminal offence. The persons mentioned here are effectively promoting hatred towards fathers and in particular, promoting murder and violence by women towards men. These are some of the scariest most dangerous people you will meet in Ottawa if you are father or a child who has a father especially if they happen to be the victims of female violence. who used to work at the Children's Aid Society of Ottawa. Metivier, who promptly "Retired" to avoid action by the Judicial Council.